The common macroscopic anatomy of all peripheral nerves and their relationship to surrounding structures can usually be derived from the anatomical atlas. It is important to know which variations can exist: several variations of the brachial plexus at trunk level, rare variations of the level where the musculocutaneous nerve separates from the median nerve, relatively frequent ramification variants between the median and ulnar nerves at the lower arm, which are important during the diagnostic process and, of course, for the correct preoperative decision making. Of less importance are anatomical variants at the lower limb: different ramification levels between tibial and peroneal nerves, respectively the medial and lateral branches of the tibial nerve at the ankle. It is also worth mentioning that the lateral femoral cutaneous nerve and its relationship to the iliac crest may vary. The microscopic peripheral nerve anatomy is characterized by a changing cross-sectional pattern from proximal to distal insofar as the primary mono-fascicular structure ends in a multi-fascicular nerve pattern in the periphery. 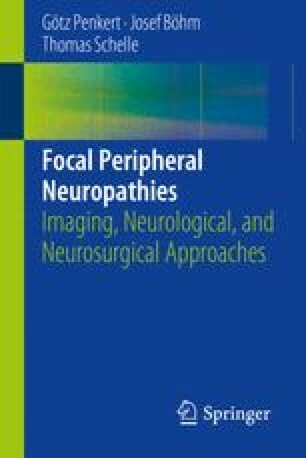 Although surgical release of focal entrapment remains in the paraneurium, knowledge of microscopically different anatomical aspects within the nerve becomes more and more important so that modern imaging methods can be interpretated correctly.